Discount Magic - 50 Amazing Illusions Book. Push a salt shaker through a table top! Turn water into ice, instantly! Cut and restore dollar bills! Change a penny into a dime, without trick apparatus! Read a spectator's mind ...and much, much more! 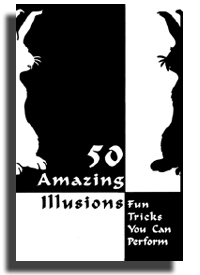 50 Amazing Illusions A wonderful introduction to magic.